In the sprightly spring of ’96, a blue box caught a newborn’s fancy; six months later, she was running ahead of everyone she knew. Orooj-e-Zafar is now a Browncoat, drudging through medical school. She fancies herself a certified overthinker and spoken word poet, frequently performing at venues such as Kuch Khaas, Minerva, among many others. Nominated for Best of the Net 2015, she has been published most recently at voicemailpoems, Pankhearst, and Up the Staircase Quarterly. She also won the first Islamabad Poetry Slam 2015 and released her first spoken word album, the articulation of my vertebrae: from being spineless to finally standing tall in October 2014. Orooj also hosts cahoodaloodaling‘s own Orooj’s Throwback Thursdays. Having finished her Jedi training, Orooj aspires to keep moving forward (and publish a book.) She resides in Islamabad, the dharna capital of Pakistan, and likes to stay wrapped in her TARDIS blanket for most of the winter. She would like nothing more than to wake up to a hot cup of chai and a good poem; engaging conversations are a close third. Her best friend is her copy of A Thousand Splendid Suns by Khaled Hosseini. 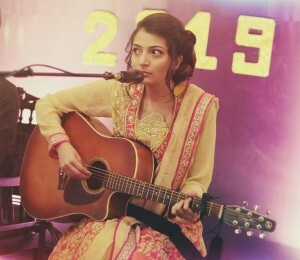 She’s been playing the guitar for a decade, sings decently enough and bakes till her problems go away. Some days she is Ron Swanson and others, Leslie Knope. Though she married slam poetry early and (un)foolishly, the universe itself remains her one true love; she’s just passing through.